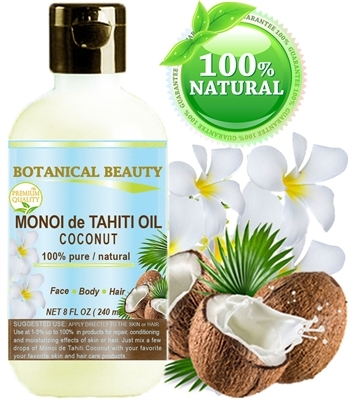 Botanical Beauty Monoi is an extraordinary oil for face, body, hair, lip and nail care. Monoi is good oil for face and neck moisturizing and may even help to reduce wrinkling. MONOI de TAHITI OIL PLUMERIA. 100% Pure 1 Fl.oz. - 30 ml. 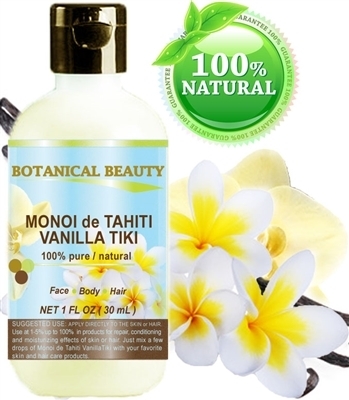 MONOI de TAHITI TIARE TIKI Oil 100% Pure 1 Fl.oz. - 30 ml. MONOI de TAHITI TIARE TIKI Oil 100% Pure 2 Fl.oz. - 60 ml. MONOI de TAHITI OIL PLUMERIA 100% Pure 2 Fl.oz. - 60 ml. MONOI de TAHITI TIARE TIKI Oil 100% Pure 4 Fl.oz. - 120 ml.